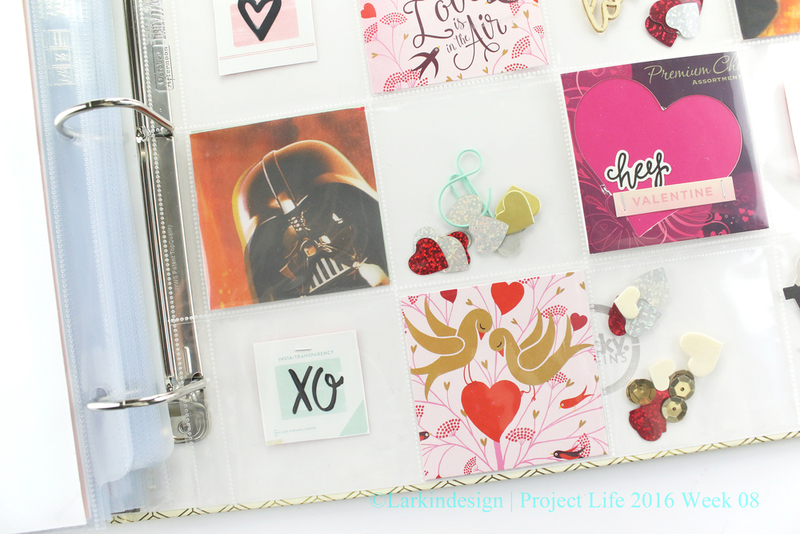 Project Life 2016 Week 08 – No Photos, Just Ephemera! 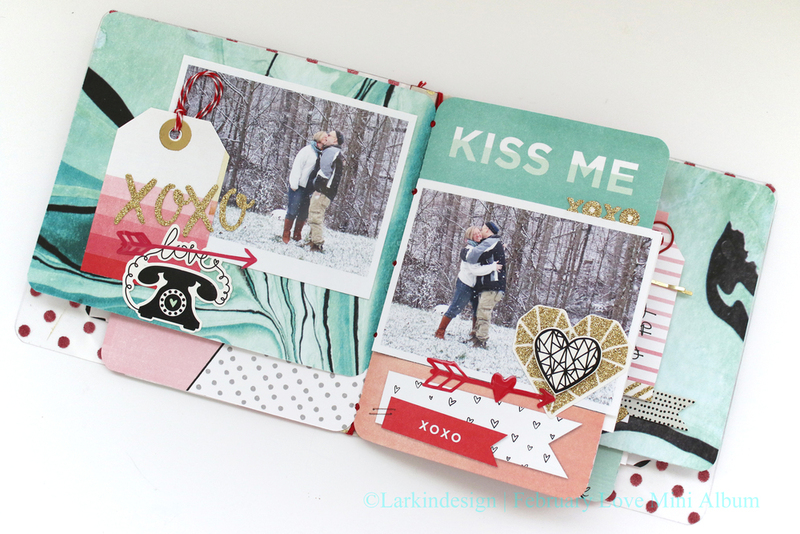 The products I used on this side were primarily from the February Gossamer Blue Main and Life Pages kits, particularly the stamp set and the Basic Grey apaers and ephemera. That is all for today, I will see you again soon! Hi friends! 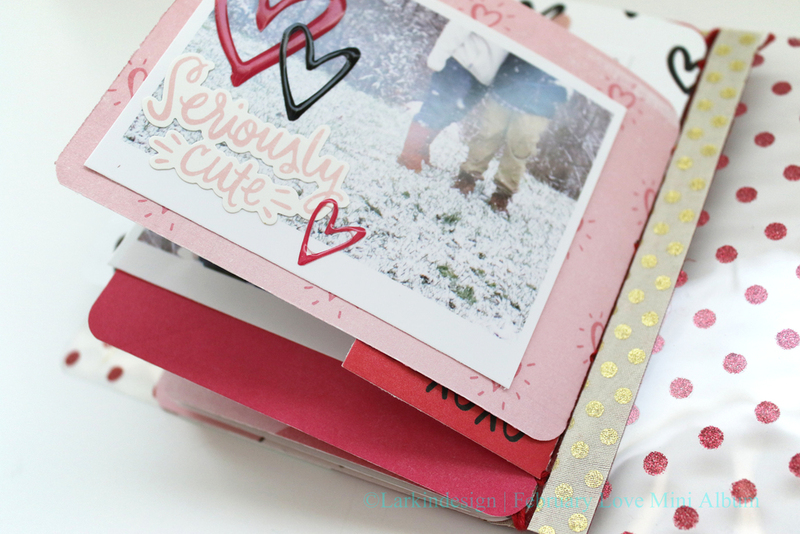 So I have not been filming much this week but I did want to show a really sweet little mini album I created for Valentine’s Day. 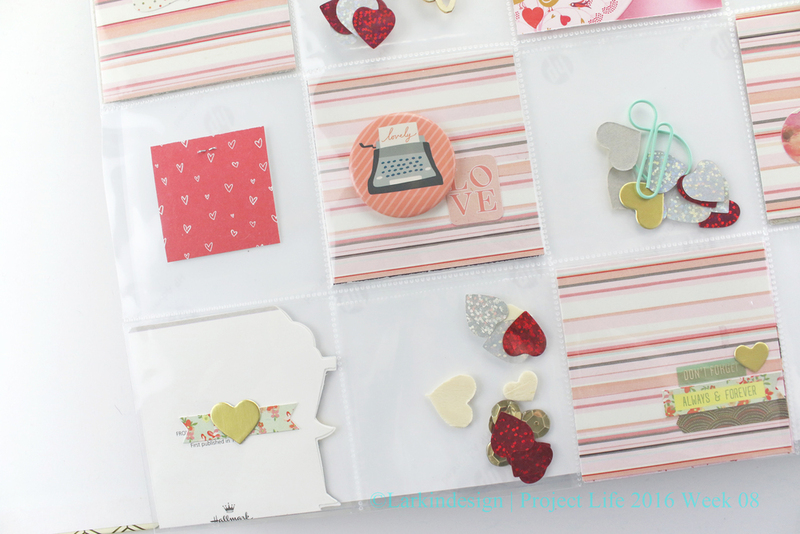 A few weeks ago I went on a pinning spree (at 1AM – do you ever do that?!?) and I came across all these really sweet couples poses and photog sessions. I decided I wanted to do a mini session with my husband and then create a little mini from that. Take a look! So for this album I decided to print all my photos the same size and orientation, since they were all from the same photo shoot. These photos are a favorite size of mine and I have used this size before. What I do is in my Print screen in Photoshop I tell the printer to print vertical orientation so the photo is across the page. 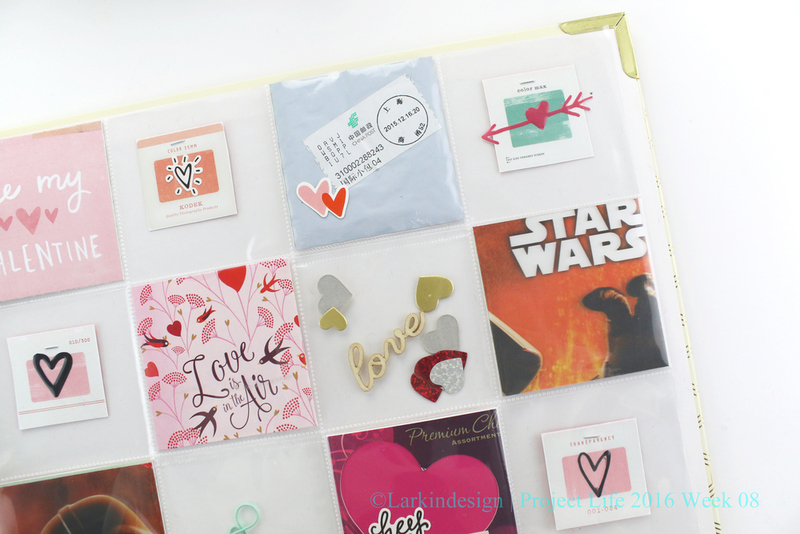 Then I tell it to print the size in a custom measurement, which is 4″ x 2.75″ horizontal. 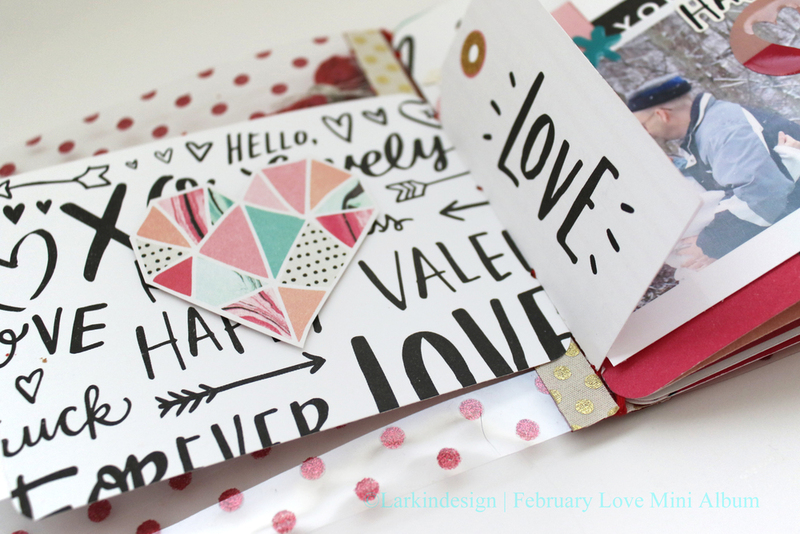 Of course Crate Paper knocked themselves out with this year’s Valentines theme collection, called Hello Love. I used the glitter acetate as the cover for my mini, and sewed the pages in place using a really old (like so totally old!) binding tape from 7 Gypsies. It was the last little bit of it that I had! I did not use many papers or embellishments for this album. 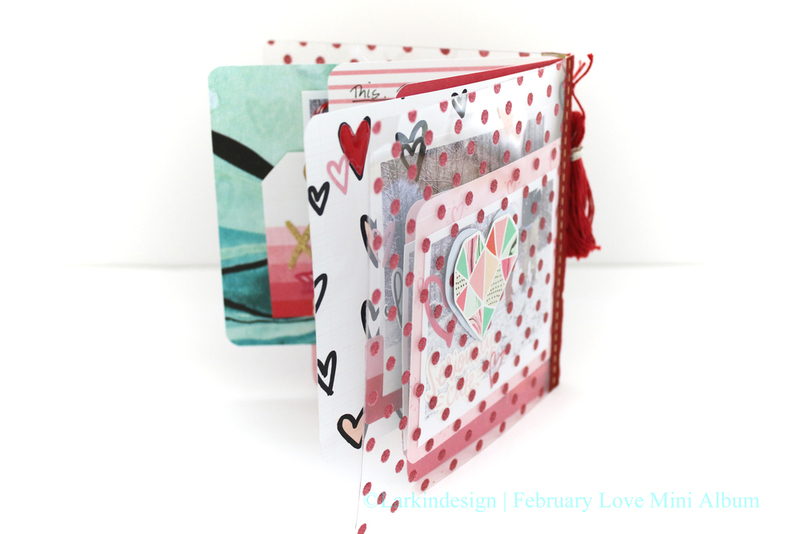 Overall the album measures 6×6, and I cut the patterned papers randomly to fit. I kept this album feeling very light. 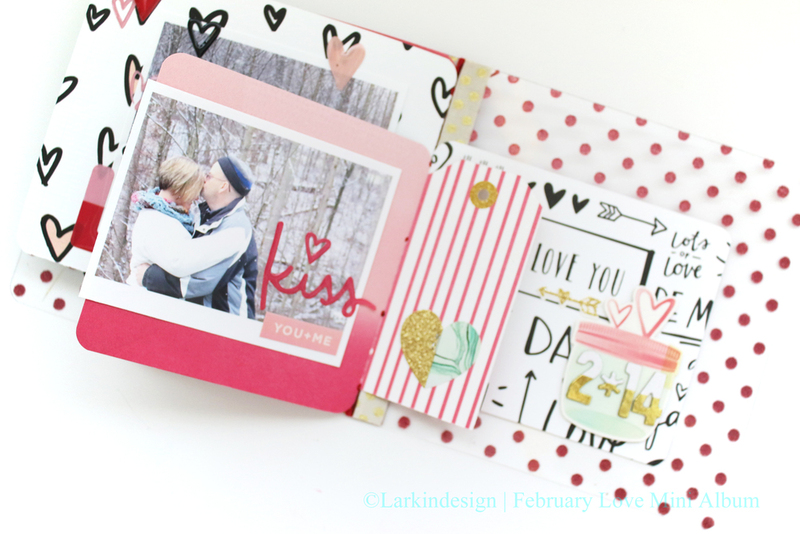 Some of the layouts do not have a photo and that is ok! 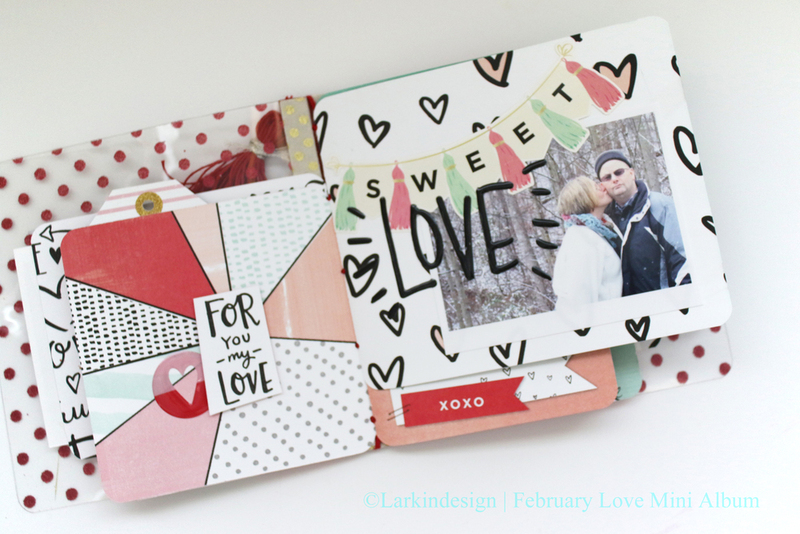 Each one of the photos I cropped purposely, leaving room on one side or the other to allow for embellishments. I absolutely love how the pages peek out with every page turn. 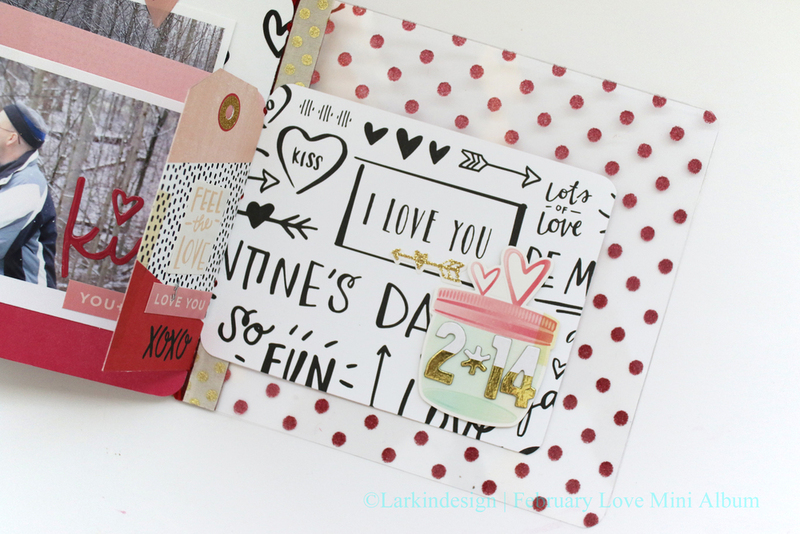 This adds visual interest and fun layering without being too bulky! I wasn’t exactly sure how I felt about this green marble paper, but seeing it completed with photo, I’m glad I included it. I think including the pink ombre tag provides a nice contrast. Again, more visual interest. This was actually the first layout I started with. 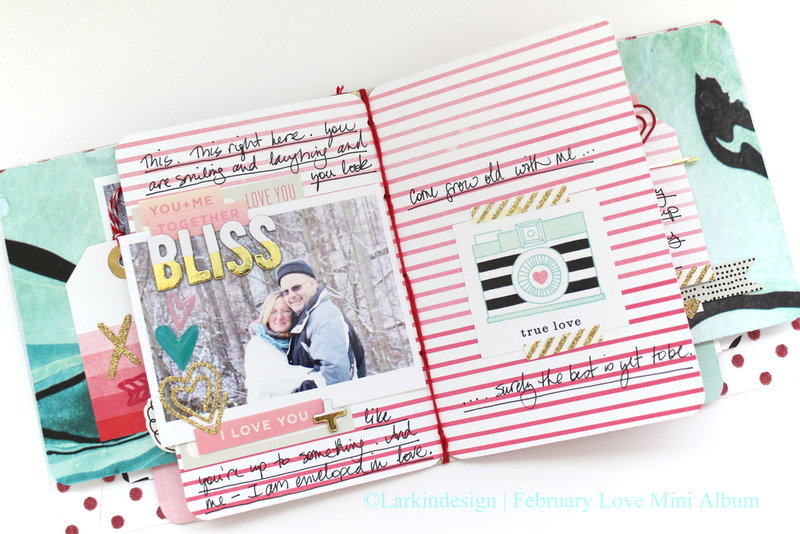 I wasn’t sure what direction I was going in when I started adding photos and embellishments, but these stripes made it easy to dig right in. 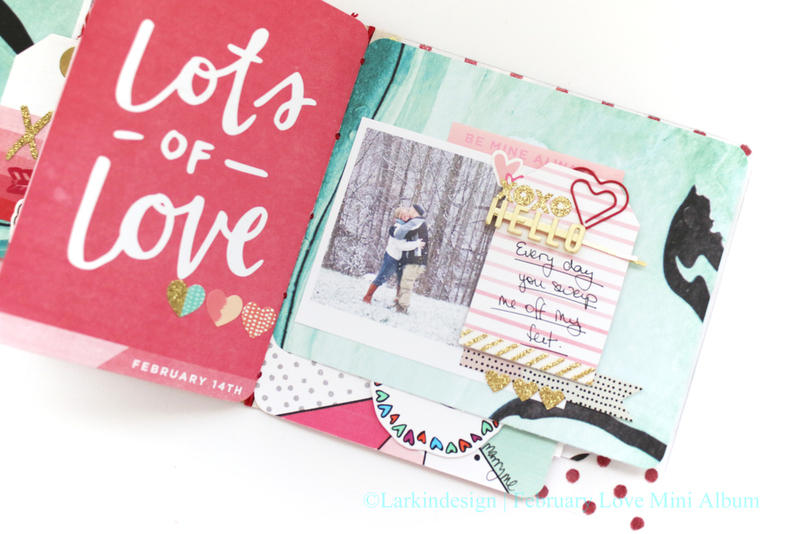 Sometimes that is ok too – start where you feel inspired and then work from there! 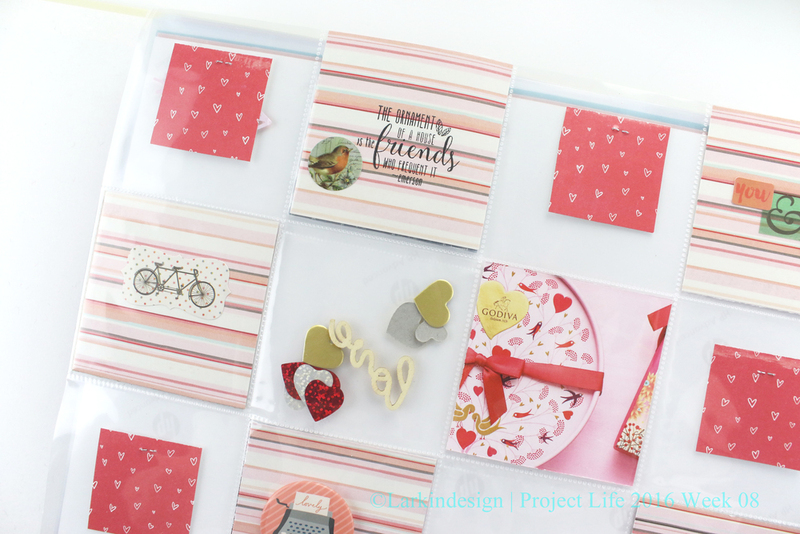 I did add two embellishments that are not part of the Crate Paper collection – the Hello clip is American Crafts DIY Shop, and the red heart paper clip came from Michael’s. That tag makes me so happy. 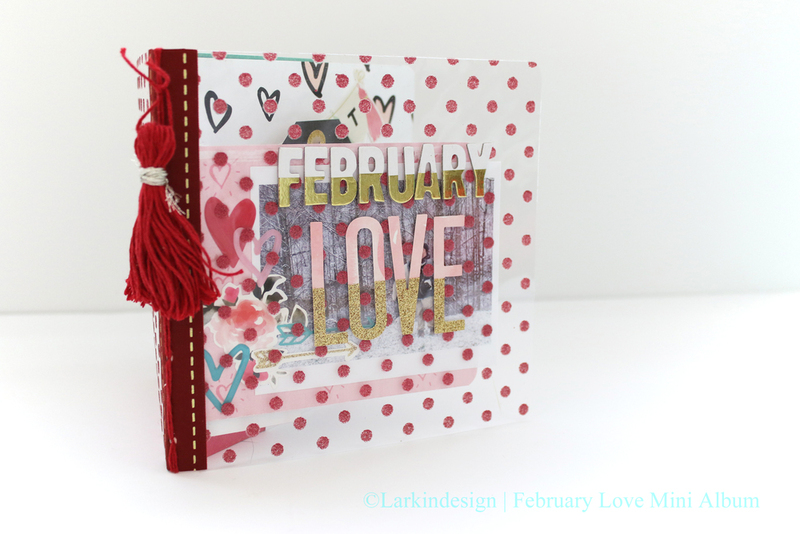 Another fun layering technique – I used some of the puffy hearts to echo the hearts on the patterned paper, and some of them overlap onto the photo itself. Also notice how I wrote my journaling on the diagonal on the facing page. I admit I was so very hesitant to cut that paper up! But this makes me glad I did. Always remember, your papers look so much better used and in your albums, than hiding inside your stash. I realize how lucky I am, to have a husband/partner/spouse who is willing to stand with me in the cold snow and take photos. Not only that, but he is willing to capture our relationship in this way, and he had a really fun time doing it with me. 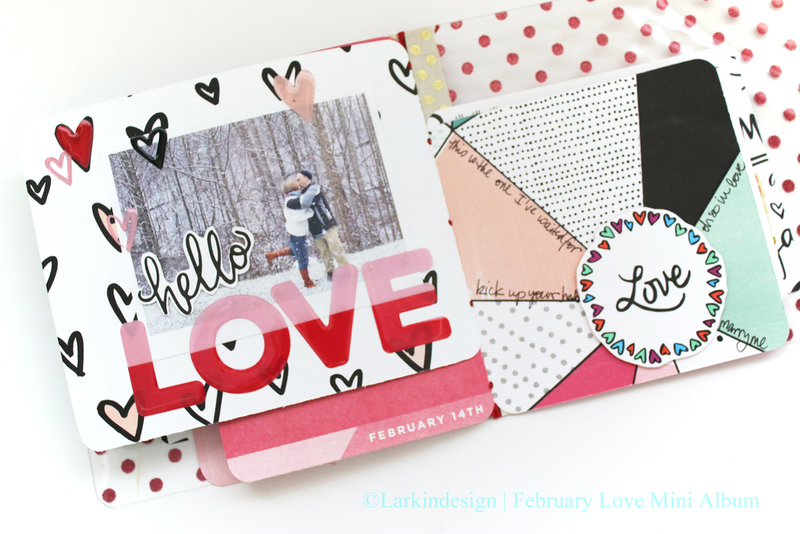 This patterned paper is such great fun and provides lots of opportunities for a focal point, even if you aren’t quite sure which focal point to choose. 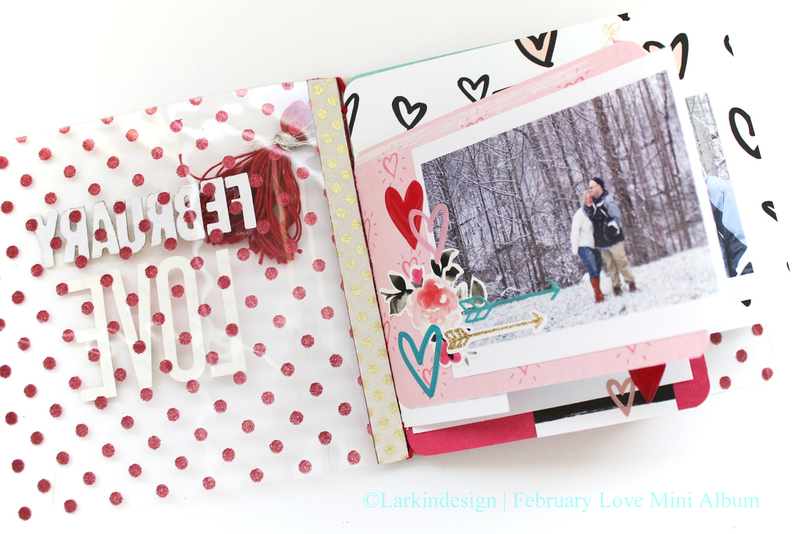 The I LOVE YOU box was seriously perfect even though I did not plan it that way, I just cut the paper and it landed that way. I call this scrapbooking serendipity. Last photo, and then here is the back cover. 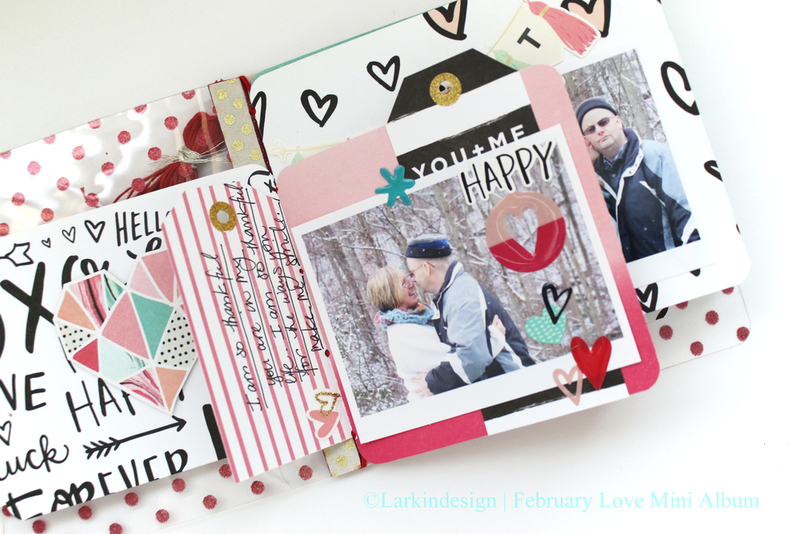 I hope you have a great Valentine’s Day and a love-filled weekend. I hope to get back onto a sort of normal posting schedule next week because I have been working on some fun stuff this week and can’t wait to share with you! See you back here soon! **This website is an Amazon affiliate. 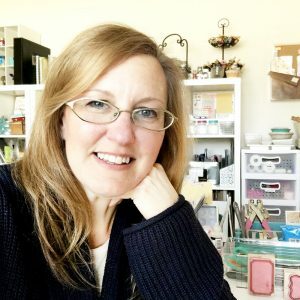 Every post I try to include links to products I feature in my post, in order to assist you with your own shopping and scrapbook endeavors. Every time you click on a link, or purchase products through these links, you help to support this blog! For that I thank you so kindly. I will let you know, however, that for some reason Crate Paper did not release much of this collection and so much of it is sold out. I hope you still find this post inspirational to use products you already have! That is always a good thing, too!